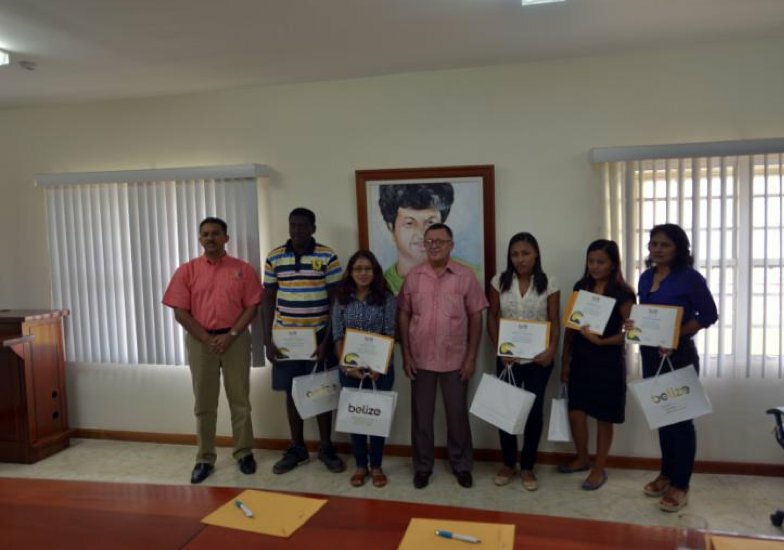 Belize City, Belize – August 24, 2016 –Today, the Belize Tourism Board awarded five (5) scholarships to students venturing into the Tourism field of studies. Minister of Tourism and Civil Aviation, Hon. Manuel Heredia Jr., presented each student with their scholarship package. Two Associate Degree scholarships were awarded. The recipients were Clarita Ack, of Toledo Community College, and Ahkeem O’Brien, of St. John’s College. Both students received a two-year tuition scholarship for a Tourism Program at one of the Junior Colleges in Belize. One Bachelor Degree in Tourism Management was awarded to Janeen Nal, of the University of Belize. She received a two-year tuition scholarship for the Tourism Management Program at the University of Belize. The Jean Shaw Scholarship was awarded to Nissa August, of the University of Belize. She received a two-year full scholarship for the Tourism management Program at the University of Belize. The Jean Shaw Tourism Scholarship was established in memory of the late Jean Ursilla Shaw, a renowned female, tourism pioneer, who played an integral part in the development of Belize’s tourism industry in her lifetime. The scholarship is to support the development of qualified Belizean females pursuing a career in tourism. One scholarship for Culinary Studies was awarded to Einar Marin, of St. John’s College Junior College. He received $10,000 towards a culinary study of his choice. The recipients were selected based on a score sheet which measured various factors such as grades/GPA, work and community service experience, an essay describing their career goals/aspirations, and their achievements/awards. Those with the highest scores were then reviewed thoroughly and the top candidates were selected. The Belize Tourism Board wishes to congratulate all students pursuing their degrees. We look forward to meeting the future Tourism Pioneers of Belize.